When I complete a logo design I always give my client versions in multiple file formats. 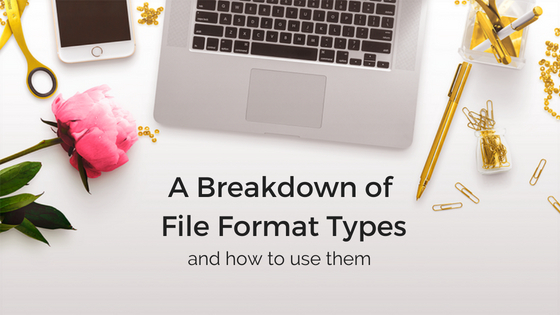 Each format has a particular use, so with today’s blog post, I’d like to break each type down so you will know which file is right for your next project. Let’s first take a look at image resolutions. Hi-Res (high resolution) is 300 dpi (dots per inch) and is used for magazine and high-quality prints. Lo Res (low resolution) is 75 dpi and is used for online and screen use only. Two things to remember a Hi-Res photo will slow down any website and a Lo-Res photo will look horrible as a portrait on your wall. .jpg – Joint Photographic Experts Group. Used for high-quality photography and can also be used for low resolution online use. Are you looking for a new logo design or maybe a refresh of your current one is in order? I’d love to work with you. Visit my services page for more information on my design packages, pricing, and my design process. You can check out my portfolio page to see my most recent work and you can reach me by completing the contact form below.